Aircraft Landing - Pilot the Plane | Mac App Storeのアプリ検索・ランキング BuzzMac! 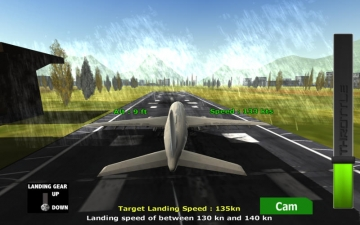 Aircraft Landing is the most exciting airplane game for your mobile. Land your plane in a range of difficult situations. Avoid an Aeroplane Emergency Landing Disaster. Be the pilot in a realistic flight simulation. Aircraft Landing makes you feel like a real aircraft pilot. Face the most dangerous weather conditions and aircraft failures and fly your passengers safely home. You have just one objective: to land safely – easy to play, difficult to master. Will you make it? - Progress through a wide variety of difficulty levels and increase your ranking to become a pro pilot. - Weather conditions: rain, fog, strong wind, turbulence, night landings. - Realistic flight models! A physics based flight simulator. Comments.app — The best way to glance at your WordPress blogs' comments!